A super compact USB charger for iPhones 3, 4 and 4S. 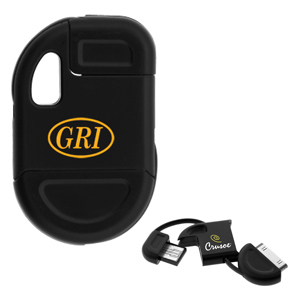 Fits perfectly onto a keychain, pocket or suitcase. Both connectors fold into one unit so there are no dangling wires. SKU:T-231. Categories: Tech Tools, Promotional Merchandise. PRICE INCLUDES ONE COLOUR, ONE LOCATION IMPRINT. Initial set-up charge applies. Additional colours/locations are $0.20(G)/unit/colour/location, plus a $60(G) setup charge/colour/location.